CVS Health and Aetna shareholders signed off on the proposed $69 billion merger of the two healthcare companies, which still needs the federal government's approval. 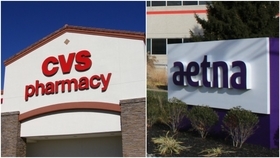 The CVS-Aetna merger, which shareholders approved by a 97% margin, is one of many proposed combinations that would blend the roles of providers, pharmacy benefit managers and insurers. Executives at the pharmacy chain and insurer hope to harness nearly 10,000 CVS retail stores and more than 1,100 walk-in MinuteClinic locations to steer patients to lower-cost settings and deliver more comprehensive care by leveraging big data. The prospect of funneling care away from hospitals has caught health system executives' attention. The proposed deal would also bolster CVS Caremark, the retailer's pharmacy benefit management arm, to compete on more equal footing with the likes of UnitedHealth Group's OptumRx, as well as Anthem's new PBM IngenioRx, which is set to launch in 2020 in partnership with CVS Health. Cigna and Express Scripts also announced a $67 billion merger last week, in which Cigna could better control costs by insourcing the biggest stand-alone PBM while absorbing its profits. Other examples of nontraditional partnerships in the industry include Optum's proposed acquisition of dialysis provider DaVita Medical Group and insurer Humana buying part of Kindred Healthcare's home healthcare business. Four health systems are also working together to create their own generic drug company with the aim of reducing drug prices and preventing drug shortages. Industry outsiders Amazon, JPMorgan Chase and Berkshire Hathaway have teamed up to form a new healthcare company to serve their employees. CVS and Aetna agreed that the pharmacy giant would take over the No. 3 U.S. health insurer, which would become a stand-alone division inside CVS. The deal is expected to close in the second half of the year, pending customary approvals. While the federal government has nixed major horizontal combinations of insurers including Aetna and Humana, it has less experience in dealing with vertical integration.